From Phat. 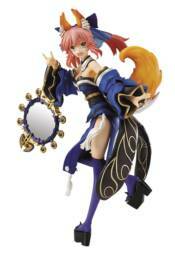 From the PSP game with an anime series on the way, Fate/EXTRA comes a rerelease of the 1/8-scale figure of Caster! She has been sculpted with careful attention given to her most notable characteristics - from her fox ears and tail to her unique blue kimono. The figure has been sculpted in a very dynamic pose overflowing with energy, and even has her posed with her right hand shaped like a fox, adding even more to her lovable charm!